The official application of the prestigious Swiss group Les Ambassadeurs, authorised retailer of the finest Haute Horlogerie and Jewellery brands: A. Lange & Söhne, Amsterdam Sauer, Audemars Piguet, Bell & Ross, Blancpain, Bovet, Breguet, Breitling, Cartier, Chanel, Diamonds of Excellence, Franck Muller, Girard-Perregaux, Graff, Greubel Forsey, Harry Winston, Jaquet Droz, Jaeger-LeCoultre, Jaermann & Stübi, Longines, Mattioli, Mikimoto, Panerai, Pasquale Bruni, Pomellato, Ole Lynggaard, Roger Dubuis, Schoeffel, Ulysse Nardin, Urwerk, Vacheron Constantin, Vulcain and Wellendorff. Discover the famous twice-yearly L.A Magazine, entirely dedicated to the luxury world, of which the enriched-content multimedia version is available in French, English, German and Italian. It includes articles from some of the finest writers in the Swiss and international trade press, dealing with watchmaking and jewellery as expressed by Les Ambassadeurs. Since luxury is an integral part of international life, you will discover some original approaches to universal time, technical challenges, as well as the ties between watchmaking and a number of other fields such as art, architecture and design – while naturally not forgetting the latest watch and jewellery trends. 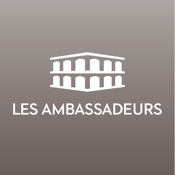 The watchfinder will enable you to compare a broad range of timepieces available from the famous Les Ambassadeurs stores. Simply select your favourite models, and watchfinder will give you a chance to admire them more easily than ever.